Visix will premiere a wide range of new products at the show, including new digital signage software applications, content designs, room signs and media players. AxisTV Signage Suite gives us a modern and scalable platform, so we can quickly satisfy market demands and customer expectations. Visix, Inc. will exhibit in booth C2328 at InfoComm 2018, June 6-8 at the Las Vegas Convention Center. The company will premiere a wide range of new products at the show, including new digital signage software applications, content designs, room signs and media players. AxisTV Enterprise lets clients manage communications on any scale with unlimited user accounts delivering content to an unlimited number of players and screens. Enterprise includes ten categories of widgets for supporting data integration, on-demand interactive content and more with extensive support for suborganizations. AxisTV Campus lets clients share content management across campus with unlimited user accounts delivering content to an unlimited number of players and screens. Campus supports commonly used higher education applications like 25Live, EMS and Google Calendar while providing the content approval workflows and alert notification capabilities (available in Q3) needed by universities. AxisTV Workgroup lets clients share content management with up to 50 people contributing and delivering content to up to 100 players and screens, and has tools to support departmental deployments with team-focused content and easy integration of organization-wide messaging. AxisTV Team lets customers share content management across a team of up to five people contributing to deliver content to as many as 50 players and screens for an entire organization. AxisTV One is perfect for a single digital signage power user, letting them centralize content management while delivering content to as many as 25 players and screens. InfoComm 2018 will be the first time that visitors can see new enterprise features like support for interactive designs and hot spots, Active Directory Single Sign-On, and unlimited users with assignable rights. InfoComm 2018 will be the first time that attendees can see ready-made content designs that will be available for purchase by Signage Suite clients. These artwork packs and kits are designed for easy installation and customization, and include background artwork, employee recognition bundles, student messaging packs, and kits for building countdowns, financial stocks dashboards, menu boards, directories and more. Visix will also highlight their award-winning interactive designs with real-world client projects showing touchscreen wayfinding and directories, responsive HTML5 designs, custom kiosks, social media modules and more. Visix will showcase the company’s entire MeetingMinder™ room sign line in booth C2328, with interactive and E Ink models on display. 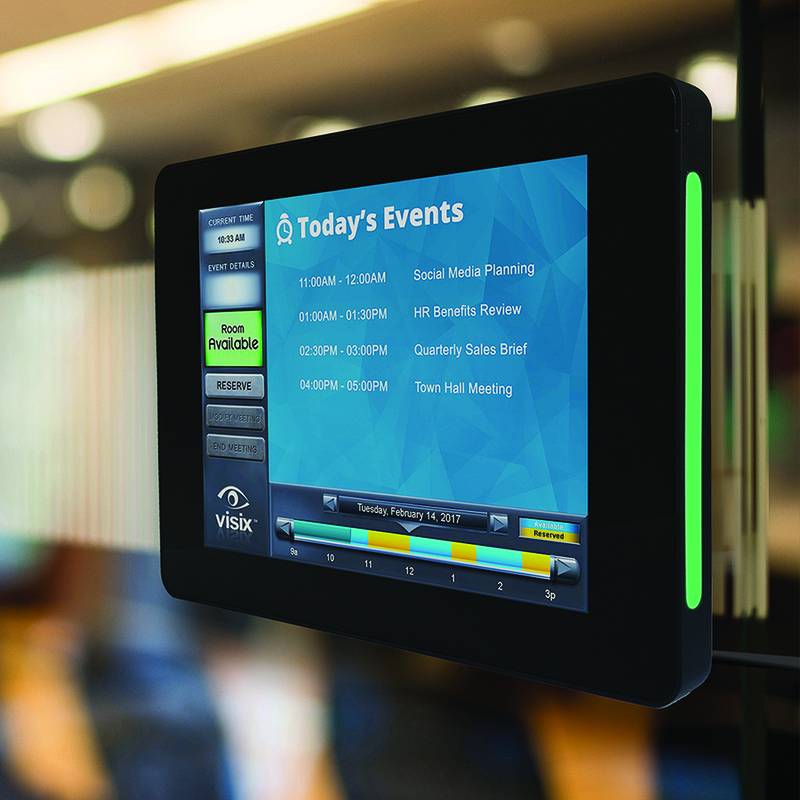 Visix will show off their new Touch10 interactive room sign—a sleek new unit with a 10-inch screen that displays event calendars, allows room scheduling at the sign, and extends digital signage playlists to meeting rooms. Also on display will be the company’s Connect and electronic-paper (EPS) room signs. Connect interactive room signs are a stand-alone solution that show room calendars from popular apps, and offer extensive room booking and meeting management features at the sign. EPS room signs use E Ink technology, and are an economical, wireless option for room management or office hoteling, with custom faceplates available in a range of shapes and sizes. 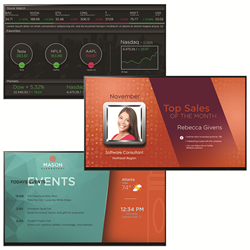 All Visix room signs show data from popular event management systems, like Exchange, EMS, and Google Calendar. Visix’s Conference app also allows you to combine multiple calendars from various systems for display on a single sign. Visix booth C2328 will feature a variety of video walls powered by their four- and six-output media players. These players support video walls made up of HD displays without a separate video processor. The players are only 2.5 inches tall, are powered by an Intel i7 processor, and have 8GB of memory and a high-performance graphics card with Mini DisplayPort outputs. The players also support full 1080p resolution per output for both landscape and portrait applications. Visix will offer free coffee, sodas and snacks in the booth, and will give away 10 Sonos One smart speakers over the three show days to attendees who swipe their badge in booth C2328. To learn more about Visix at InfoComm and download a free exhibit hall pass, go to https://www.visix.com/infocomm/. InfoComm is the largest technology exhibition and conference in North America focused on the pro-AV industry, with 1,000 exhibitors and 44,000 attendees from 110 countries. InfoComm is part of a global alliance of trade shows, produced by AVIXA and its partners, including Integrated Systems Europe, Beijing InfoComm China, Chengdu InfoComm China, InfoComm India, InfoComm Southeast Asia, TecnoMultimedia InfoComm Brazil, TecnoMultimedia InfoComm Colombia, TecnoMultimedia InfoComm Mexico, Integrated Systems Russia, and Integrate. For more information about the event, visit http://www.infocommshow.org. Visix, Inc. designs, develops and supports a suite of browser-based digital signage products that allows users to create, manage and schedule organizational communications from anywhere and to deliver messages, media and alerts to virtually any endpoint. The company offers digital signage software, award-winning content design, meeting room signs, and applications for targeted messaging to desktops and personal devices. 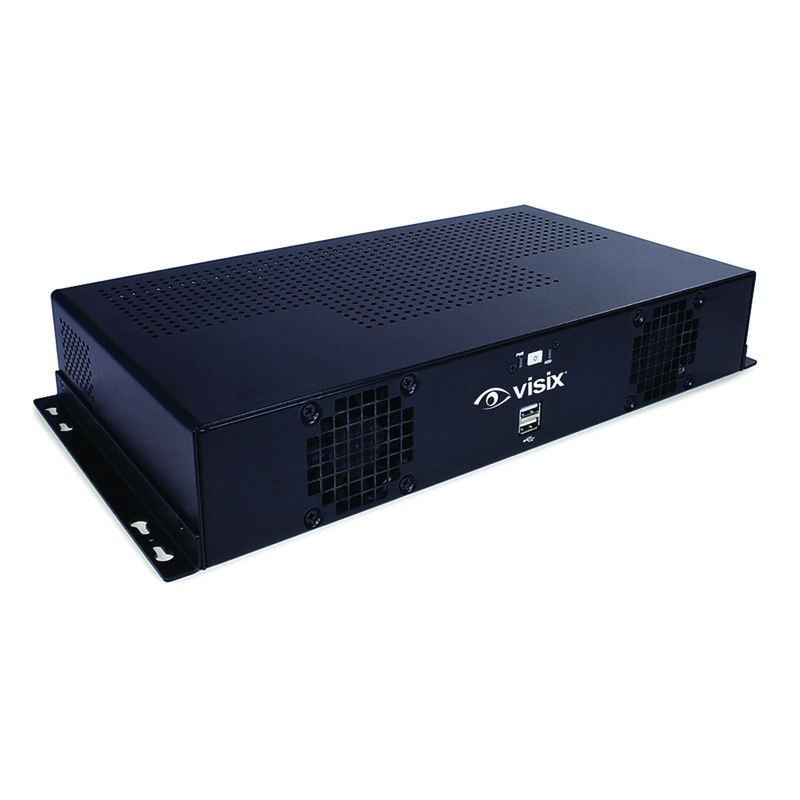 Learn more about Visix digital signage products and services at http://www.visix.com/.